Part Two of this series addresses American communist groups that organize outside of the Democratic Party, unlike their Democrat friendly counterparts, which were discussed in Part One. Broadly speaking, there are two categories of hard-left organizations in the United States: those who organize within the Democrat Party and those who don’t. Those who generally stay away from the Democratic Party include dedicated ideologues who are more likely to engage in street violence and—like their Democrat friendly counterparts—work with foreign communist regimes and groups. The Revolutionary Communist Party’s front group, Refuse Fascism, placed a full-page ad in The New York Times that was signed by former Weather Underground terrorist, communist, and friend of former President Barack Obama, Bill Ayers; professor of theology and Democratic Socialists of America (DSA) member Cornel West; and militant anti-Israel activist Marc Lamont Hill, to name a few. Communists of all stripes descended upon Ferguson, Missouri, in the wake of the shooting of Michael Brown; they were behind the Standing Rock standoff over the Dakota Access Pipeline in North Dakota; they flooded to the border to support the Honduras Caravan at the end of 2018; they descended upon Charlottesville, North Carolina, in August 2017 to protest the so-called “Unite the Right” white supremacist rally; they were behind numerous violent anti-Trump protests of 2016 and 2017. In the early 20th century, the Socialist Party USA (SPUSA) was the largest Marxist group on the U.S. left with 100,000 members and boasted numerous elected officials, mainly in the Midwest. The SPUSA lost many members to the Communist Party USA (CPUSA) in the 1920s, and much of the remaining remnant to the Democratic Socialists Organizing Committee in the 1970s. Today’s SPUSA overlaps with the Green Party in some areas, with the Freedom Road Socialist Organization (FRSO) in Memphis, Tennessee, and with DSA nationally. In Memphis, the SPUSA controls the Mid-South Peace and Justice Center and interacts with local Democrats such as Rep. Steve Cohen (D-Tenn.). The SPUSA is probably less than 1,000 members in total, but has a presence in almost every state. 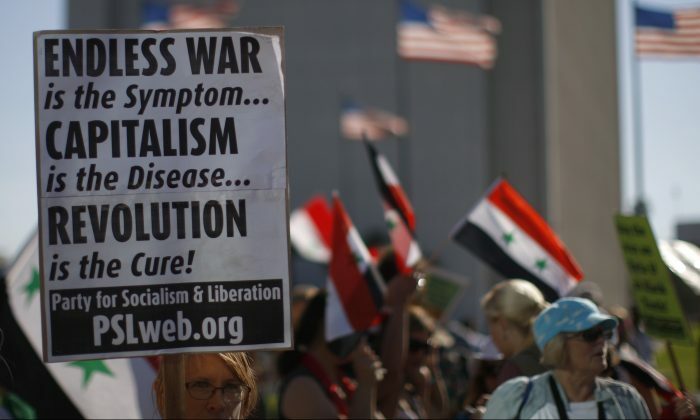 In the 1970s, the Socialist Workers Party (SWP) was a leading force in the anti-Vietnam War movement. Its newspaper, The Militant, was widely read on the U.S. left. The SWP began as a pro-Leon Trotsky split from the CPUSA in the 1920s, and for many years was the country’s second-largest communist party. Currently, the SWP is a shadow of its former self. The Freedom Socialist Party (FSP) began in 1966 as a split from the SWP in Seattle. It is militantly feminist, “anti-racist,” and pro-Cuba. Today, the FSP has branches in Los Angeles, New York City, San Francisco, Seattle, and Melbourne, Australia. It probably has less than 200 members in total. The WWP has close ties to Russia, North Korea, and Cuba. These people are one of the most dangerous communist parties in the country. The WWP has 400–600 members in about 30 branches, mainly in the New York, Boston, Chicago, and the West Coast. The Party for Socialism and Liberation (PSL) was originally created in 2006, as the result of a split in the WWP, although their “political line” is almost identical. The San Francisco branch, as well as several other members, left the WWP in 2004. The PSL has since established two national branches in Washington and in San Francisco, as well as more than 20 smaller branches throughout the United States, from Sarasota, Florida, to West Virginia to Portland, Oregon. The PSL is a dynamic and growing party but suffers a high burnout rate of cadre. It is probably 500–800 members strong. The PSL is very close to Russia, Iran, North Korea, and Cuba, even the ruling Communist Party of Nepal. PSL leader Brian Becker is a regular on Russian propaganda channel Russia Today and has his own show on Russian channel Sputnik. Freedom Road Socialist Organization-Fight Back! The Freedom Road Socialist Organization-Fight Back! (FRSO-FB) split from the Freedom Road Socialist Organization in 1998 but kept the same name. FRSO-FB is centered in Chicago, Minneapolis, and Wisconsin, with some strength in New York, North Carolina, northern Florida, eastern Texas, Arizona, Utah, and California. It’s probably around 500 members strong, more if you count its youth wing, Students for a Democratic Society. The FRSO-FB is hard-core Maoist. It supports China, and three officially designated terrorist organizations: the Communist Party of the Philippines, Colombia’s FARC guerrillas, and the Popular Front for the Liberation of Palestine. Because of these connections, the FBI raided the homes of several FRSO-FB members in September 2010 and issued subpoenas in a search for evidence related to material support of terrorist groups. No charges were ever made. FRSO-FB works closely with the WWP and together have built ties to pro-Putin elements in Russia. The FRSO-FB also has close ties to Venezuela. People’s Tribune was the newspaper of the LRNA, with Rally Comrades! now its official publication. Its best-known affiliate now is probably Caleb Maupin, a convert from the WWP. He is a regular guest on Russia Today and a correspondent for Iran’s PressTV. The ISO publishes a daily online and monthly print newspaper, Socialist Worker. ISO also distributes the International Socialist Review and titles from the publishing house Haymarket Books, both of which are run by the nonprofit Center for Economic Research and Social Change. Socialist Alternative (SA) is in political solidarity with the Committee for a Workers’ International, a worldwide Trotskyist alliance working in more than 30 countries. SA is the second-largest U.S. Trotskyist grouping after ISO, with probably 600 to 800 members active in most states. Though probably less than 200 members, the diehard Stalinist PCUSA sees itself as the true leader of American communism and has reached out to more “mainstream” communist parties in Mexico, Cuba, Europe, Russia, and Canada. The PCUSA is strongest in Los Angeles and New York City, where it has some influence in the Transit Workers Union. The PCUSA publishes a magazine, Ideological Fightback!, and runs a front group called the U.S. Friends of the Soviet People. Revolutionary Communist Party (Revcom) is the most cult-like group on the U.S. left. These people worship their great leader Bob Avakian and hang onto his every word. Revcom has roots in the Maoist student movement of the Vietnam War era of the 1960s and 1970s. It has active chapters in at least 15 population centers, mainly centered around their Revolution bookshops. Once boasting several thousand members, Revcom today is probably around 500 to 800 members, centered largely in Chicago and the Bay Area. Their newsletter, Revolution, is published weekly in print and online. The Antifa-like “Refuse Fascism” protest group is a front group for Revcom. Revcom’s trademark is burning U.S. flags. If you see protesters in black T-shirts gleefully immolating Old Glory, it’s almost certainly Revcom. No matter how this revolution is achieved, the United States is the biggest obstacle in their path. Once the United States succumbs to communism, these activists believe they will directly oversee a new world order. 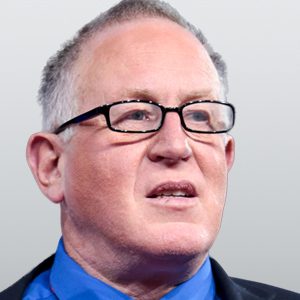 Trevor Loudon is an author, filmmaker, and public speaker from New Zealand. For more than 30 years, he has researched radical left, Marxist ,and terrorist movements and their covert influence on mainstream politics.